Too many to choose from? Why not save £6 per box and treat yourself or someone special to one of our great value lucky dips. Each box contains six different varieties, all labelled and ready to go! The fuchsias listed in this section have an upright growth habit (otherwise known as bush fuchsias). These varieties will need frost protection during the winter months, but make excellent choices for patio pots or summer planting schemes. 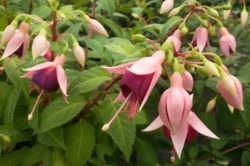 The fuchsias listed in this section are characterised by their miniature blooms and small leaves. The fuchsias listed in this section are just some of the 'original' fuchsias from which all of the exciting cultivars have been bred. They can be found growing wild in parts of South America and New Zealand.